> FLYING BOATS and FLOAT PLANES > P-Boat: One - U-Boat: Nothing! 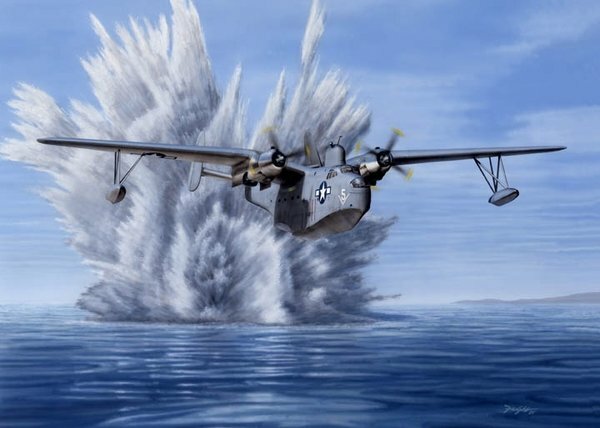 The big, tough Martin flying boats were already in service prior to America's entry into World War II and were real workhorses throughout the war in both the Atlantic and Pacific Oceans. Mariners were quickly adapted to the role of anti-submarine warfare against the Nazi U-boat wolf packs in early 1942. Production of Mariners continued until 1949 and they served with the U.S. Navy on into the 1950s during the Korean War before being phased out. This picture shows a Mariner over calm seas attacking a submerged U-boat with a low-level depth charge run. The aircraft's ordnance was carried in a unique bomb bay located in the engine nacelles. It also had the capability of carrying torpedoes under the wings.